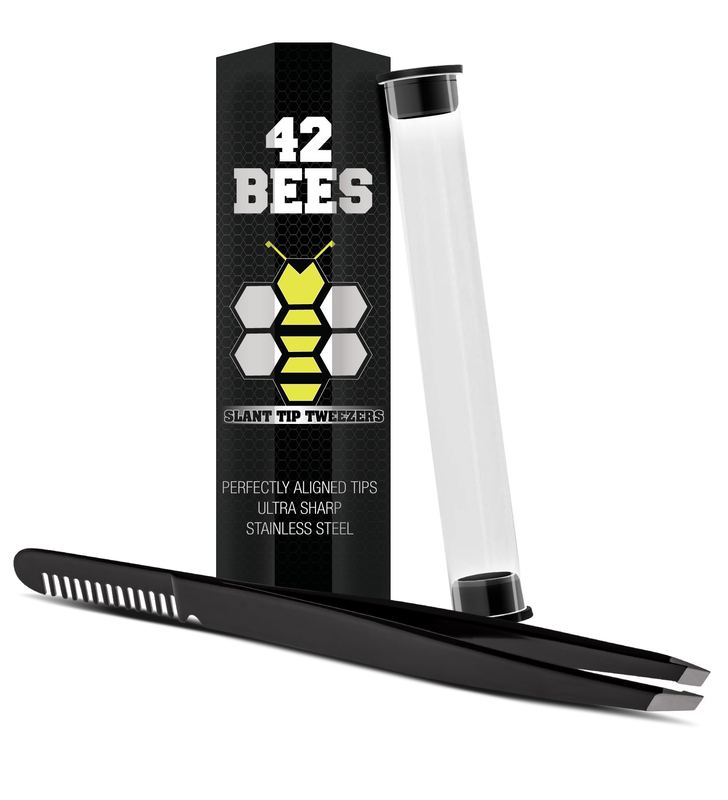 I just got these great tweezers from 42 Bees and I use them all the time. This is a really nice set of tweezers and they work really well. It comes in a plastic case you can store them in and keeps the well protected and clean. The end is slanted so you can really get the item you are trying to remove and get a great grip. They work really well for splinters or in grown hairs. It has a comb on the end of it though, which I have never seen in tweezers before. This makes it really convenient for plucking eyebrows, you can use the comb to brush the eyebrows and then the tweezers to pluck. Very high quality and works really well. ★ 4.9 OUT OF 5 STAR REVIEWS – “They are comfortable to use and the width makes it easy to securely grasp the tweezers. Nothing more frustrating than tweezers that don’t grab fine hairs, these get even the finest hairs, and the grip is very comfortable too.” – Jenny, one of the many happy users of 42 BEES Slant Tip Tweezers. ★ PERFECT EYEBROW TWEEZERS Integrated eyebrow comb lets you shape as you tweeze with complete ease. Prongs are extra strong because they’re forged from the same stainless steel body of the slant tip tweezers. Simply comb your eyebrows before or during tweezing so that you can see more clearly which hairs need to be plucked. It’s that easy. And the best part is that you no longer need to carry an extra eyebrow comb in your other hand! ★ 0.4mm PRECISION TWEEZERS Ultra sharp tweezers slant head grabs hairs and splinters others miss, and hold their grip perfectly because they’re crafted and filed by hand. It’s very important that tweezers are sharp and hold their tension, which is why we insist on making our slant tip tweezers just the right level of sharp (0.4mm) to get any size hair on your face or body the first time without breaking the hair. ★ PROFESSIONAL CRAFTSMANSHIP Made from high quality durable stainless steel to provide you with the perfect tension needed to grip and pull hair. Say goodbye to cheap metal tweezers that bend with time and lose their shape and grip! Stainless steel isn’t just pretty to look at, it’s an essential ingredient in making products that last. ★ VERSATILE DESIGN Not just for eyebrows! Also ideal ingrown hair tweezers & first aid tweezers. The truth is we’re all guaranteed to run into pesky splinters or stubborn ingrown hairs at some point, but we don’t have to wait until that time to think of how we can lessen their impact on us. Since our slant tip tweezers are just the right size to fit in any bag (purse, wallet, first aid kit, etc..), with the conveniently included PVC carrying tube you can use them wherever and whenever you need them! You can purchase a set of these tweezers on Amazon! Make sure to enter the giveaway to win a pair for yourself! Enter below! I would love to win a pair of these awesome looking and very useful tweezers! From all I read they sound amazing!! !